ESRB: T for Drug reference and violence. Genre: First person adventure, in the vein of Metroid. In 2007, a small developer set out to make a DS game not exactly in the norm: Not only was it survival horror, like the Resident Evil series, but the graphics were supposed to be fantastic for a handheld. Did it work? Mostly. The graphics were lauded, and the play was fun. But several issues kept the game from selling well. Repeated rooms, monsters and a buggy save system were the most stated complaints. Why is this important? Because Renegade kid, a relatively unheard of group, created it. And using the new Renegade 2.0 engine, that same team came back to release Moon. Hardware pushing graphics, “epic” story line and crazy speed. Renegade Kid was going after 60 frames per second, which is odd for a handheld FPS considering some console games don’t even reach that. And hopefully removing those annoyances that plagued Dementium. Did they succeed? I’ll lay it out and let you decide. 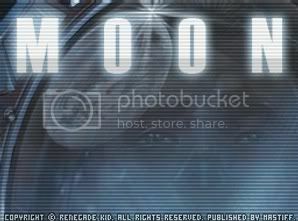 In Moon, you play the role of Major Edward Kane, chief officer of ETEO--Extra Terrestrial Encounter Organization. Arriving on the Moon, you discover an alien hatch, missing people, and a commanding officer with secrets. Soon after Kane’s arrival, things go wrong. People go missing down the hatch, this time from the Trained ETEO team guarding it. Kane isn’t going to have that, and so grabs his Super Assault Rifle and down the hatch you go. And that’s when things become interesting. First thing you’ll find down the hatch is a nifty little toy called the RAD or “Remote access droid” that is used throughout the game as something similar to Metroid\'s morphball function. Namely, it goes where Kane can’t and gets things that he can’t reach. And of course triggers hidden switches for Kane to proceed. Crawling through tunnels and under crates, the trusty little robot is priceless while traveling through the Moon’s vaults. But it has no real offense. Just a little Ion cannon that stuns enemies. That adds in some more suspense, as if the RAD blows it’s game over, and several times I was required to hide the thing in a corner while I ran in as Kane and blasted whatever enemy was in the room. Another cool feature is the fact that both the RAD and Kane are active at the same time. So if you missed a bad guy before going into droid mode, Kane will get shot as he sits there helpless. I say cool, but maybe realistic would be a better word for it. Getting your health drained while you don’t pay attention gets aggravating after awhile. But seeing as the RAD sits in your weapons menu, and switching back and forth between them is simple and easy, that shouldn’t pose much of a problem as long as you keep an eye on the health gauge. The second thing that you’ll pick up down the hatch is the Muon pistol, a weapon capable of taking out most sentries with one shot. I had a few problems with the weapons in Moon, at first. Figuring out how to use them efficiently takes time. The Lepton spread--a very powerful shotgun type weapon--is useless from any kind of range, but get in the face of an enemy and you’ll have a very effective weapon that comes in handy when you walk around a corner into an enemy. After you get the Quanta rifle, you‘ll quickly realize: Nail a few shots on something, and it isn’t very effective. But continuous fire will drain energy pretty rapidly. My favorite weapon of all would have to be the seeker pod, a rocket launcher that automatically tracks onto enemies and dispatches them quickly, with a big bang. The other weapons (there are eight including the RAD) I’ll not spoil, because figuring them out in combat is part of the fun. Big bad guy? Meet big gun. Moon achieves something that most First Person games don’t: A sense of solidarity. It’s quite easy to feel alone down the hatch, and after a bit of exploring you’ll start to get that eerie hair raising feeling that is normally given to games in the survival horror genre. Not that this is a survival horror game, mind you. But you’ll see some pretty nasty things under the moon’s surface. I won’t spoil the story too much, but you’ll come across live--and dead--humans in various locations around the compound. Atmosphere is a very strong element to this game, but action is not, surprisingly. If you’re expecting Halo, this will disappoint. There is usually some action in every room, but mostly it plays out slowly: shoot the bad guys, solve a puzzle and move on. A few driving levels are scattered about and these are pretty fun, and the Lola-RR10 rover is unashamedly similar to Halo’s Warthog. It felt like I was alone, even the communications between Kane and his friend and fellow strandee, Suki, couldn’t shake the feeling that Kane was past the point of no return in the Hatch. The story also plays a part in this, as you’ll not only come across logs of what the aliens are doing to the humans but also logs of the first scientist to go down the hatch, his musings and fears. The story progresses in two ways; through the Conversations between Kane and the base, and through the logs that are scattered around. Which could be bad depending on how you play the game. I tried to find every log, but if you don’t the story will seem flat, or even non-existent. Moon\'s graphical goals are successful, for the most part. Bright colors, detailed surroundings and all at a brisk 60 FPS. The best I’ve seen on a DS First person game. To put it simply, they’re beautiful. You’ll see flares if you point the camera toward the sun, and the first time you walk out the hatch and see the Earth hanging above your head in the star field will probably take you by surprise. The animations are smooth, and fluid. The space suits are detailed in a very cool way. Looking like something you’d see on a NASA website. But there is a downside. The in game videos look a bit blurry. 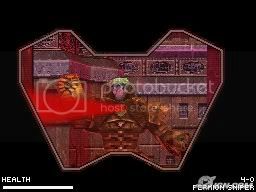 They are low res, but they have the same skill in their making as the rest of the game uses. But the DS cartridge does have space limitations, so I’m not complaining too much. A side effect of this is enemies and rooms are recycled, meaning you’ll face the same designs, but with different colors. Same with bosses, except it’ll be a different color, different type of room or have something guarding it. So they didn’t fix one of the problems with Dementium. The save point issue is fixed nicely, though. Maybe a bit easy, actually. Your health is refilled at every save and it auto saves before and after every boss. Also, a bit of slowdown occurred on the final level, in which 5 sentry droids, the final boss and two of my rockets were on screen at the same time. Wasn’t a game breaker, I was able to control through it, and it lasted less than five seconds. I’m also told that the first copies of Moon had a glitch, where driving the rover into a garage before the game calls for it results in starting the next mission, a time based one, without the rover. Causing you to fail every time. It’s about an hour into the game, so you can see why that would aggravate. Renegade Kid has fixed it in later versions, or you could avoid driving the rover into the garage. Either way, it’s not a serious thing. Controlling Kane is simple: Use the D-pad to move forward and backward, and to strafe left and right. L button shoots and the start button pauses the game. All the other functions are taken care of on the touch pad. Switching weapons is drag and drop. Touch your current weapon and a list pops up, pull the one you want down and you’re good to go. A touch button at the top of the screen is used for the interact option, to examine, pick up, or read terminals. 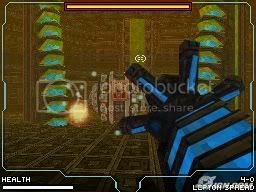 Everything moves smooth and accurately, beating even Nintendo’s Metroid Prime: Hunters. I think Renegade Kid has set a new bar as far as DS first person games. Except for vehicle controls. Which were exasperating at worst, “loose” at best. The sounds of the Moon are also a negative point. The music is 8-bit-ish, with beeps, bops and the occasional burp. It is, however, different in every level, for which I was extremely grateful. There are even some voiceovers in the opening and closing clips. Kane has the appropriately deep voice you would expect for an alien fighting marine. It was rather good in a Captain Kirk meets Master Chief kind of way. All other communication is text with a picture of whoever is talking. Again, I believe this is due to the space requirements on the DS. Moon falters somewhat at the appropriateness level. And as such I’m going to have to include minor spoilers in the following. There is no blood in the game. But bodies abound. Throughout the first level you’ll find dead people, albeit in spacesuits, commonly. The logs can also be rather disturbing, as they catalogue the process for, well, processing a human body. Extracting fluids from organs, extracting organs, terrifying the in-stasis humans to up levels of adrenaline and other icky things are mentioned in the logs left around the compound. Violence in the game is mostly against robots, and even when it isn’t the aliens just explode in a fireball. Language is mostly minor, with several uses of D*** and H*** appearing in the communications, and B***** is also said a few times. God’s name is used a few times as Kane and Suki discover the full ramifications of what the facility does, and aphrodisiac is read as one of the effects of an alien miracle drug, but that is as far as it goes. Another thing, though small, is the fact that you see naked people floating in tanks. The reason I say small is the fact that no details are on them, not even eyes or a mouth. If your not bothered by gingerbread men cookies, this wouldn’t bother you either. I think I managed to get through a space-based “Marine in a suit with a rifle” game without mentioning Halo too much. It’s mentioned a few times, of course, because some things were taken from Halo. Deep voiced hero, vehicles with no traction, space-suited marine, ETC, ETC. But really, Moon isn’t Halo. Farthest thing from it. Closer to a certain female Bounty hunter in armor, that we all know. The point of that is, I heard about Moon a few years back, and naturally got excited over the prospect of an FPS game for the DS. After playing, I realized my hopes were somewhat dashed. It wasn’t an FPS after all. It was a fun game, of course. But it took me awhile to get into. At one point I even put the game down for a week or so, then picked it up to see the conclusion for the story. I’m glad I did. Moon is good, but not an FPS. Probably, the player would be disappointed if they went into it thinking it was a FPS (as I nearly was.). Moon just doesn’t play that fast. It’s more about story and atmosphere with light puzzle solving. Think of the shooting as just speeding up the game a bit where it might otherwise lack. Not very much incentive for me to beat it again, because the only unlockables are training missions. These aren’t hard to unlock, as you need to collect three alien artifacts in each level, and I found them easily enough the first time through. Three difficulty levels though, and according to the guidebook veteran mode is “truly punishing, and should only be attempted by the bravest players”, which I’ll agree with. I played through the first level for this review, and it was pretty hard. In the end, Moon falls closer to Metroid (in case you didn’t catch that Female bounty hunter reference) than Halo, with Health and ammo expansions to collect, solid story and more puzzling than blasting. A solid title that I hope Renegade kid will follow through on. Oh, except the ending. Which nearly mimics the ending of Halo 2.